In the past couple of decades industrial processing systems have turned to automation driven by the need for high accuracy, precision and performance. Technological advancements in today’s day and age have successfully applied automated machines in a wide range of industries dealing with well defined processes and products like the manufacturing and automotive industries. The healthcare industry has faced its share of challenges however. One of the major challenges is inefficiency and documents subject to high human error in a non-automated environment. This also leads to substantial amount of time dedicated to administrative activities, restricting movements or engagements in the workplace. Duplicate data entries along with misplacement of patient documents are also a major challenge. Two UR5 robots now optimize the handling and sorting of blood samples for analysis at the Copenhagen University Hospital in Gentofte. The solution enables the lab to uphold a target of delivering more than 90% of results within 1 hour despite a 20% increase in samples arriving for analysis. E- prescriptions, automated billing, electronic medical records and appointment reminders, advanced scheduling, clinic management, insurance claim automation and inventory management are some of the IT solutions due to automation. With recent technological developments, robots are venturing into the healthcare industry with careful manual supervision. Robotic medical assistants monitor patients’ vital statistics and alert nurses when there is a need for human presence, allowing a nurse to monitor multiple patients simultaneously. These assistants also automatically enter information into the patient electronic health record. Robotic carts may be seen moving through hospital corridors carrying supplies. Robots have also started assisting surgeons, which allow the surgeons greater precision and a higher success rate with their operations. These robots also undertake simple tasks like drawing blood, check patients’ vital signs and conditions, and take care of the patients’ hygiene if needed. 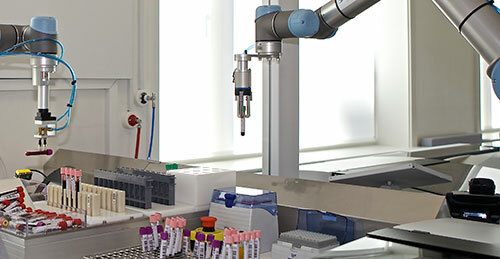 Robots also prepare and dispense medications in pharmacological labs. There are also “gears and wires” robotic assistants that help paraplegics move and administer physical therapy. With a vision of higher production rates and the need for human interaction with machine automation, Universal Robots launched the first commercially viable collaborative robot in 2008. Universal Robots is the leading manufacturer of advanced user-friendly and light industrial robotic arms. The collaborative robots - or cobots – are finding their place in the Industrial 4.0 automated revolution now propelling the healthcare industry. Massage Robotics, a Southern California startup, is integrating the UR10 arm from Universal Robots into a life-sized massage robot named Alex. The solution will address the $12 billion massage market by completely rethinking the human-centered massage experience, allowing clients to talk to Alex with natural language and share their favorite massages with friends and doctors online. Over the past three years, however, a vision-guided robotic system called the CBot has been under development in the Northern part of Spain that can apply several types of such physiotherapy automatically. While the condition of the patient is still diagnosed by a trained physician, the robotic system emulates the role of the physiotherapist, relieving heavily-burdened clinics from their workload. Three robotic arms from Universal Robots were incorporated into this piece of technology so engineers could easily adapt the software to the specific needs of the patient and the required tasks. 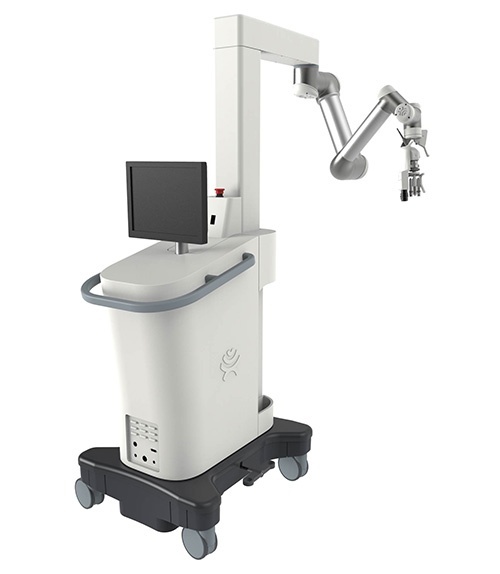 The easy programming, installation and collaborative nature of the industrial robot arms allow surgeons, nurses, theater staff, and robots to work side-by-side and care for patients. The Patient@Home Project was developed by the Odense University Hospital Neuro-rehabilitation Centre in Ringe, and Universal Robots, to assist people rehabilitating from blood clot and stroke related injuries. The service robot is called Rainer and is designed to help patients with repetitive functional movements as part of their rehabilitation process. This technology can support therapists by allowing them to set up specific training programs that the patients can undertake safely with the robot. There are a lot of opportunities as part of this initiative. Universal Robots have been working with Aurolab which is associated with the healthcare centre. Aurolab is associated with the Arvind Eye Care Systems and have provided them with co-bots that have increased affordability helping people regain vision at lower cost, and has considerably reduced the power consumption and quality problems. 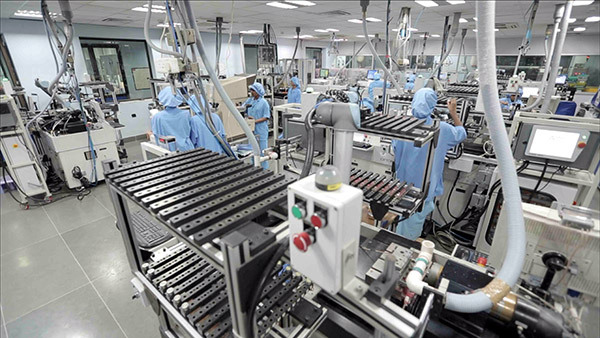 The labor force at Aurolab actually increased from 15 to 700 and production improved from 150 to 10,000 Intra Ocular Lenses (IOL) per day. They are exporting to over 130 countries due to superior quality of their lenses. Aurolab have seen a 15% increase in the annual product output. According to IBEF, the Indian healthcare industry is currently pegged at around $158 billion and is expected to hit $280 billion by 2020. The use of automated machinery in the healthcare industry will be a timely expansion as healthcare services would be taken to the next level. Automation and incorporation of cobots will be the future of the Indian Healthcare Industry. Automation of this sector has the potential to do so much good: to bring medical care to regions where even today there is none to be found; to lighten the load of medical professionals; to help people walk again. To reap the benefits and avoid the potential dangers of such a technological revolution we need to keep informed about the strides that science makes so that we can better prepare and adapt to the not-so-distant future where robots play a crucial role and work closely with us. Pradeep David is the Country Head at Universal Robots (India) Pvt. Ltd. Based out of Bangalore, he is one of the strong pillars of the company responsible for setting up & running the operations of Denmark based Universal Robots A/S, in India. A qualified expert in robotics and industrial automation, Pradeep is a Masters in Mechanical Engineering (Robotics) from Clemson University, South Carolina, USA and has also completed his MBA in International Business from Marquette University, Wisconsin, United States. Pradeep joined Universal Robots India in October 2015 and ever since has been persistent with his effort and sure vision of the ambitious growth strategy for the company to fulfill the goal of making the company a market leader in the segment of robotics that they operate in.